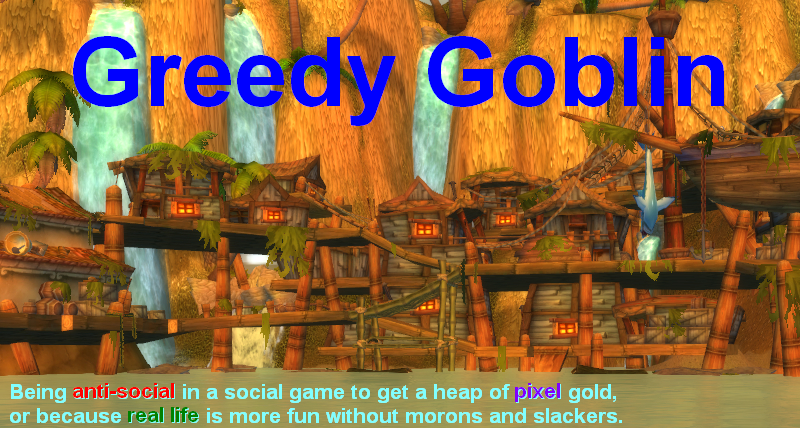 Greedy goblin: What is actually wrong with the dance? What is actually wrong with the dance? In series of posts I shunned the boss dance in raids. However I did not actually tell what is wrong with it. All I told was the dance belonging to the "dexterity" skill, while MMOs fit to the "hard working" skill. However it is not an answer to the question in the title. Call of Duty, an FPS (naturally dexterity based game) just made the biggest sale ever in the industry. Maybe the "we want the raids be more casual" actually means "we want the game to be a dexterity-one as it has bigger market". Call of Duty says it is. However the shift to dancing did not increase the subscriber count or even the raider community. Shrinked it. The solution is that the boss dance is above all a bad design and being dexterity based is a secondary issue here. The reason is the lack of "skill" attached to it. Every game hones some skill. The FPS family hone hand-eye coordination, reaction time. As I get better in an FPS I feel my "skill" is improving. It's something general, at least in the genre. I mean if I'm good at doing headshots on the Aztec map of HL-Counterstrike, I'll be good in not only other CS maps, but also Halo or CoD. I learned something. I'm stronger than before. I progressed. WoW already has dexterity elements. Not standing in the Circle of frost of a mage is one of them. If I learn to not stand in it, I get better in WoW PvP. I will perform better in Tol Barad, Isle of Conquest, Arathi Basin, Warsong Gulch, Battle for Gilneas, Twin Peaks, Alterac Valley, Strand of Ancients, Eye of the storm, Nagrand arena, Ring of Valor, Ruins of Lordaeron, Circle of Blood, Dalaran sewers, and also when attacking an enemy city or defending our own city. If I learn to fly in the circles of Alysrazor... I will be better at Alysrazor. I gained no "skill" that will help me on further raids, I did not become any better, I just learned Alysrazor. Bosses could have dexterity elements, if these elements would be transferable to other bosses and PvP. For example some bosses could use Circle of Frost. Could get damage bonus on slowed targets like frost mages. Could put on immolation which makes their next lava burst crit. Could whirlwind. Could throw several different dots and debuffs to dispel at once, demanding dispelers to prioritize. Could use traps and AoE spells. They would be like players, just with much more HP and damage. Learning to handle an ability would be a "skill" as it will allow you to defeat other bosses and players. It would only need bosses to not be scripted. They have a set of enlarged player abilities and would use them at will. The bosses of a good raid wouldn't have to be all Patchwerks, they could use hundreds of abilities, while remaining challenging and fun. The "dance" is called dance for a reason. It's not a dexterity based challenge. It's learning and mindlessly executing a script. We know what the boss will do and know what to do, the "challenge" is to do it in the proper millisecond. It's annoying. And not rewarding if successful as it gave us no skill. The only reward of killing Alysrazor is not having to deal with the damn thing again. And some useless pixels that will be beaten by the reward of a facerollable 5-man in the next patch. You already had an excellent comment in one of the earlier threads how most of the "dance" skills that you don't think are any use on any other boss, actually are. If we look at Firelands, I just don't see that it's so bad. Shannox: I seriously don't see what the dance part in here is. There is ages of time to get out of traps and even if you don't, it's healable. The eruption thing, you can only get hit by if you're standing close to Riplimb. Carefully thinking of raid positioning makes it a non-issue. Rhyo: the driving is gimmicky, but not that hard to get right. Moving out of lava flows is not hard if you know to not stand next to volcanoes aka. plan ahead a little. Beth: Really don't get what's hard about going upstairs? Climbing the rope or moving out of the fires there? Nothing about this is dance, it's dead simple. Bal: No dance. Only the shards requiring some communication on HM. Alys: you know what? The flight bit is not in the least bit hard _if you have keybinds_. If you're staring at the actionbar, it will never happen, but if you can just focus on flying while doing that rotation by heart, without thought - there is no issue. There's a trick to it as well - recognising that the rings and clouds follow a pattern and following that makes it easy. This is not about learning the dance, it's about being able to dps and move at the same time - which many people really can't do well at all but that certainly will help on other bosses as well once mastered. Domo: no dance unless you call running out of really easy to see fire dance. Raggy: has elements that require quick reactions and again planning movement ahead carefully - but it's an end boss. Should be like that. If I understand it right your complaint is that because of the dance, you can't constantly bring in new players and expect to smoothly farm everything. Well... if it was like that, there would be no challenge whatsoever to more organised and fixed teams. I think perhaps the new LFR will suit you better; it's tuned for pugs without communication composed of newbies. The PuG was a fine experiment, but it kinda proved to me that raiding is a guild activity where you need group cohesion and communication. And that's how it should be. These dance complaints stem from the fact that your playerbase it not very good anymore, if I had to guess. Tier 11 had just as much gimmicks and dance as Firelands, after all. It happens to all guilds... there's ups and downs. Honestly, that strikes me as a solid idea. Giving bosses player-like abilities (maybe spiced up a little bit here and there - grappling hook instead of death grip, etc, etc.) would indeed build a set of satisfying, transferrable skills applicable all over the game. I'd love it. But then, I come at WoW from the PvP side of things. "They have a set of enlarged player abilities and would use them at will." This would destroy the bosskill metagame by making individual skill impossible to compare between raid groups. Your server first would be declared meaningless, because, for example, in your rival's attempt, the end boss used whirlwind right after he heroic leapt on the ranged and killed three people, while your group wasn't so unlucky. There is a reason why end bosses are (unlike the Halfus's of this world) very, very predictable - and there's still RNG griping. The PvE competition requires a standardised test to be meaningful. Have you done Faction Champions in ToGC-10/25? Those bosses used player abilities, but some combinations of characters proved very hard to beat. Even when my guild was getting 50 attempts chest casually, Champions were the worst boss of all. Anub'arak had a much higher DPS/HPS requirement, but it wiped us only when people weren't paying attention. That encounter was different from other bosses in game, but it was just awful. "Dancing" in WoW is closer to a series of Touhou games than Call Of Duty. Same "boss patterns". "Bosses could have dexterity elements, if these elements would be transferable to other bosses and PvP. [...] Could use traps and AoE spells. " Sounds like you're making the apology of Faction Champs in ToC, a fight that, to my knowledge, no one really liked. The recipe has been tried in MGT before, so it's not like Faction Champs are a completely new concept. So what you're really saying is: I don't like raiding. Raiding has always been about beating a scripted encounter by following a script to beat him. That's raiding. If you don't like it, then don't play it. Most Boss mechanics are just getting a new visual and are then tacked onto the next boss anyway. You can easily transfer most things you learn to the next boss. Raid awareness, teamplay, movement, dps, reaction time are all skills you learn and that will shorten the time it takes you to learn the next boss fight. I think this is shown by the fact alone that many many guilds cleared firelands on week 1 without any ptr practice. You know how it always gets super easy to follow the script once you run with a group that's already cleared an encounter? It's the same effect that happens when a group of players play in the same team together for a long time. And it shortens the time it takes to learn a fight as a group tremendously. Put the best group of players together in completely different groups, and they'll fail spectacularly, if the content is hard enough to require that kind of teamwork. Alysrazor flying is so simple, it's hardly worth commenting. All you do is literally follow a boss around while casting your standard rotation. Big deal. If a player fails at THAT 3 times in a row, just boot him. "However the shift to dancing did not increase the subscriber count or even the raider community. Shrinked it." There is nothing stated to prove a correlation between the decline of WoW subscription and specific raiding mechanics. The decline might as well be related to the recent economic situation, the direction the wind is flowing from, or the amount of chickens born on Aunt Irma's farm. Furthermore, your only example appears to be Alysrazor, and only Alysrazor. I know why: there are no other examples. Yet, Alysrazor was heavily nerfed. Any moron can kill it now. I don't understand how people from The PuG can have so much difficulty with it? Are these people not good at a simple dexterity mechanic? You'd think that, with all the pro experience from PvP, a dexterity-based mechanism like Alysrazor would be a piece of cake. 1) Ranged and healers can now move while casting (makes evading anything faceroll). Tank DPS finally matters (finally a way where a good tank can prove himself). This is NOT a dance mechanic. 2) There are fires which slowly move. Evade them. This is a dance mechanic, but an easy one; see #1. 3) There are tornados coming. You run one way and evade them, might have to follow a different one which passes by. This is a dance mechanic which pre-nerf required some exercise. Now, completely face roll. Morons can even pop survival CDs here such as deterrence, AMS. 4) Your melee need to interrupt a 3 second cast. Which is only cast if the DPS is low. If fail to interrupt (should not happen), must be dispelled. Not a dance mechanic, easy mechanic with fallback to healers. 5) Your tank gets a DoT which is auto removed if he get below 50% health. Very easy to heal, 2 ways out (depends on #6), not dance. 6) Your tanks need to eat the worms in time, preferably when hatchling is likely to throw a tantrum or is throwing a tantrum. This is a bit random, requires good awareness of debuffs. But not hard, not dance. 7) Then the stacking, potting, nuking, usage of CDs, interrupting of adds. Not dance. 8) The only thing I did not mention is the flying up. If that is dance, then so is Valithria Dreamwalker. All in all it is a very easy fight, even on HC, and even pre-nerf it was not hard but less forgiving (therefore required more practice). It is a long fight which requires some focus. 1) Don't stand in fire. If it moves to you (slowly), this rule still counts. 5) Not healing tank (let DoT fall off) saves mana/GCD. 6) You can move and DPS/heal (you already knew how to do this with spiritwalker grace). 7) If there is a tornado following you, you run away from it. 8) Haste is good for your DPS. Learn to combine it with proper CDs. All basic mechanics, useful in other PvE and PvP. Only #6 is not useful, tho it is for shammies, melee, and ranged DPS with a lot of instant spells. And the Valithria Dreamwalker for DPS mechanism requires a bit of practice, and I hope to see back again. As I already mentioned we already saw it in ICC, but then the healers version. "We know what the boss will do and know what to do, the "challenge" is to do it in the proper millisecond. It's annoying. And not rewarding if successful as it gave us no skill." Yes, it does. It allows you to combine reaction time (dexterity) with randomness (tantrum, brushfire), with preset (scripted) timers. By the way, the whole boss fight is scripted. Even V&T, M'uru, and C'thun are "scripted" and involve randomness, dexterity, and the preset timers. We're not talking about milliseconds either. You make it sound much harder than it is. On Ragnaros milliseconds matter together with high output during difficult dance, with tons of randomness. Not on Alysrazor. And since Ragnaros HC is the hardest boss, and the current HC end boss, it ought to be difficult in my opinion, a real challenge. Your example Alysrazor rings. Flying there is no different from flying at Valithria to get healing buff. It is quite similar to flying at Al'Akir. I agree that you can't use this skill in pvp but many players do not PVP at all. The bosses of a good raid wouldn't have to be all Patchwerks, they could use hundreds of abilities, while remaining challenging and fun. But that's what they already do! The vast majority of all boss abilities are simple recolors/renamings of something that we've already seen a dozen times. Once you identify the ability for what it really is, you can use your transferable skills to counter it. If I learn not to stand in a static voidzone, that makes me better at all encounters that features voidzones (even if they look like flame patches, poison puddles or spike traps). If I learn how to turn a boss away so that they raid doesn't get hit by a frontal cleave, that makes me better at all encounters that have a frontal cleave (even if it looks like an eyebeam attack, fiery breath or pistol barrage). If I learn how to time my cooldowns so that I can burst down a cultist add that needs to die within 5 seconds, this makes me better at all encounters that feature similar adds (even if they look like elementals, crystals, water tanks or demonic chains). Of course, that still leaves us with the minority of boss abilities that *are* unique or near-unique. Overcoming these abilities teaches us non-transferrable skills. Are they still worth learning? I'd say they are, for one very simple reason: Blizzard loves reusing its own ideas again and again. The unique ability of yesterday is the once-per-tier ability of today and the cookie-cutter mechanic of tomorrow. Learning "3D coordination" skill just for Malygos and Oculus seemed pointless back in the day - but it greatly reduced my learning time on Valithria, Al'akir and Alysrazor. Learning how to drive Rhyolith seems equally pointless - but I'm willing to bet a stack of Truegold that we'll see at least one boss in MoP featuring a recolored/renamed version of the same mechanic. Oh, and your idea about sharing a single pool of abilities between PvE and PvP is very interesting, if not viable for WoW. It would require a major shift both in the design philosophy (every content patch would introduce new class abilities to coincide with the release of new raids) and in Blizzard's organization (the Raid&Dungeon and Class Balance teams would need to be merged). I don't believe it could work for WoW, but it could work very well for some other game. There's only two mechanics in Firelands that don't have similar mechanics already having been featured in previous encounters. The phase transitions on Domo and the choice of terrain on Shannox, and both of those are strategic mechanics, not tactical. They're only concerns for the raid leader, not individual raiders. Entirely agree with Ephemeron. As he eloquently described earlier this week, learning the meta skills is important. I'm still struggling to understand or appreciate your argument Gevlon, which leaves me with two alternatives: I'm too stupid to understand your argument, which is possible or your argument has a hidden motivation which makes it irrational because you're trying to make the facts fit your feelings - You just don't like these bosses. With respect, there's a reason they call it a dance. Just because you know how to step, twirl, jump, shuffle, lift and reverse individually doesn't mean you're automatically capable of executing any combination of them to master a complex choreography. The problem is not execution of individual moves, it is sequence and timing. I imagine under Gevlon's model the pace of the fight would be slowed down to allow for human reaction and processing of the unexpected. As it is, it relies primarily on muscle memory of the script, even with DBM prompting. So if i unserstand you correctly. You dont learn anything from killing alysrazor, that you cant use in any other raidencounters or other situations? There were hundrets of comments with examples, how wrong you are..
You name Alysrazor... Okay, what abilities does alysrazor have? Fire on the floor that moves. You are saying, that you will never have to move out of fire, that moves? Spinging fire breath. Never saw abilities where you had to move, so you dont get hit by a frontal firebreath? If you really think, that you are right. Compare a established raider (4 years exp.) and a newbie on fireland bosses. They should have the same dextery skill level! 1. a big add that our pala tank has to tank. Like in thousand other fights, he has to catch the add really fast and turn it away from the camp. 2. small adds that have to be bombed. Like in thousand other fights (i.e. Cho gall) you have to bomb them really fast. So this is what our bottom group has to do. The other group has to use the vehicles to go upstairs. (clicking on vehicles, yeah, we already did that!). Let the Tank go up first, np we have Voice com. Upstairs are meteors that can hit us, avoid them. So i dont have to explain the rest. We talked about 15 min about the boss, gave different objectives to the raiders. Pala tank bottom, warrior tank top, pala healer also top, mage top. Boomkin, dk bomb small adds. Hunter and dk taunt hanging spiders. So should i tell you something... We killed it in our first try, on the first day of release. Wow... we really had to learn the dance and we couldnt use any skills from previous encounters, like assigning positions, aoe, tanking adds, avoiding meteors. Hell, we did everything in so many fights, that i wont name them all. But some fights (try to find out the abilities on your own!) only from previous content. 1.5 seconds average... That's just starting action, not actually "moving out of bad", which for most encounters can be another second or two. In current encounters if you take that long you can easily wind up dead from any next random ability - if not dead right there. Audio signals are also significantly faster. I guess this is why GTFO addon is popular - it only provides highly distinct audio cues, and it makes immense difference in reaction speed. Default audio warnings for WoW are really bad - many abilities have none, or something like slight "fire cracking" sound you can barely hear behind sound of your own casts! And visual warning are absolutely not distinct enough, driven more by "visuals" and "theme" instead of being "stuff you absolutely cannot miss". There is NO problem with mechanics themselves. Slow it down, and you'll see that people absolutely can deal with "dance". If you have to put strict timing and fast reactions, don't force them on everyone - make it a few people who have better reflexes and can practice "kick rotation", kiting, passing cores etc, while the rest deals with more general stuff. They tried to have different abilities in Magister's Terrace (5man TBC) for Patch 2.4. Do you remember the outcome afterwards? The M&S were up in arms in the difficulty when facing Princess Delrissa and her band of random cronies. "The instance is brutal and unforgiving if your group is not either overgeared or of an ideal design." "Magisters' Terrace is by far one of the hardest 5-man instances in the game with difficulty (and loot) on par with Karazhan." Sadly, the reactions appear to have significant impacts on the future design of 5man instances. What is wrong with the dance? In a FPS game your "dancing" skill will determine if you kill your target. I don't have to depend on some other player to get my reticle to line up with a head shot. In WoW raiding, no matter my own skill set, I can't kill anything alone and depend on 24 (or 9) other people to accomplish my task. It is frustrating when you are skilled but you have some moron who is incapable of using a higher brain function to analyze a situation(fire bad...must move to new location)and act accordingly. That is what is wrong with the dance. You know, maybe we should get some addon author to write us a "DanceScore" addon. It would check the player's mobility/awareness achievements, compare them to their statistics, and give you a crude estimate of his fire-dodging skills. For instance, someone who's done 5-man ZG a hundred times and still doesn't have "It's Not Easy Being Green" would score low, while someone who managed to complete "Do a Barrel Roll!" within three attempts on Alysrazor would receive a high grade. I'm not claiming that previous experience will confer automatic mastery with all similar encounters. However, that does not render said experience absolutely useless (despite what Gevlon and Tobold claim). Being good at headshots in Counterstrike will not grant you a 100% win rate in Halo - but will certainly help. Being good at micromanagement in Starcraft 1 will not grant you instant mastery over Starcraft 2, but it will greatly reduce your learning time. Learning raiding meta-skills (or "dancing", as you prefer to call it) will not make you immune to wipes, but it will noticeably reduce their number. The ones that require you to make small sidesteps (Meteor Burn, Immolation/Crystal/Magma Trap, Sulfuras Smash) generally have give you about 2.5 - 3 seconds to do so, and, assuming that you were at full HP, don't automatically kill you even if you fail (although your fellow raid members won't appreciate having to heal/dispel/free you after you fall through Beth's web burns, stand in Shannox's traps, or blunder into Rag's lava waves). The ones that require you to run to a specific spot to avoid dying/wiping (Splitting Blow, Smoldering Devastation, Countdown) give you a whopping EIGHT seconds to do so. Gevlon, thanks for answering my question about what is so bad about "the dance." However, I disagree with your response, and apparently, so do most here. First of all, something I agree with: I would like a little more RNG in certain fights. Dealing with some randomness can be exciting. However, I don't know how to reconcile that with being able to easily compare progression between guilds, since the same boss behaving different ways is essentially a different boss. I doubt dexterity can really be "learned" to as great an extent as you indicate. Most people probably hit the ceiling of the performance of their fast twitch muscles pretty early on in their gaming experience. Everything after that is learning how to respond to specific stimulus, like run away from the fire. And what is the problem with learning skills in each fight that are only useful in that fight? So what if you have to learn new patterns for each fight? And does running away from the fire or any other mechanics used in any of the fights really not carry over to at least a few other fights? I beg to differ. Most fights demand at least a few of the same skills as many other fights, even if it isn't from the same tier or expansion. What was actually wrong with the dance was pre-nerf scaling. It was too unforgiving for casual players, and led to lowest common denominator raiding. Post-nerf, most all of FL has tolerance for some mistakes, and can be over-powered with gear. I'm surprised you didn't take a "goblin" solution when the pug stalled. The only 2 FL elements I consider outside the normal realm of raiding are Alys flying and Rhyo driving. Why not hire a pro-flyer from /2? A blue geared alt would do just fine, since the damage ramps up with the buff. Same for a pro-driver. While I also hate the dance, I don't agree with Gevlon's reasons. "The dance" is a bad thing because is a complete turn-around from everything else leading up to it. WoW is marketed as a MMO RPG. RPG's have evolved, and are more action oriented now than ever, but the sort of random goofy jumping and moving required for new raids resembles more a mario brothers game than an RPG. You spend months leveling up to max level, using your class abilities to kill monsters, your gear, level, and use of class abilities are the only things that allow or prevent you from seeing success. You start raiding and all of that is thrown out the window- instead of needed a certain level of gear and skill to defeat monsters, you need coordination and pre-knowledge of the mechanics. "The dance" may be a valid style of play for a video game, but it doesn't make a fun RPG. No doubt that some players left because they disliked the direction of raiding; but I haven't seen a solid argument that increased "dance" was why most of them left. Ephemeron - The addon is an excellent idea can I suggest it's called "LenGoodman" ? Anyway, 1.5s is from the point you can actually see the threat to the point you register it as such and take action (+ latency, both ways), and in case you're not distracted by anything else - otherwise reaction time rises. And where "run and dodge" is the only part (Alysrazor tornadoes), pre-nerf reaction required was actually lower then this threshold. "Predict relative movement of something while you move yourself" for humans isn't easy task at all! In "big nerf" they did acknowledge it by reducing tornado speed. In most other cases you still need to "tank", "heal", and "dps" in raiding environment - and engagement there varies a lot between people, classes, specs, and raid roles. If you can run it on "full auto" and only look for warning signs, your reaction speed can get higher, but something like "quick scan of cooldowns vs BigWigs timers, then quick scan of raid positioning and people in range for healing" can make you temporarily blind to things suddenly appearing under you. Shannox traps, for example, can be close to invisible, unless you get prompted by addon. They are irregular, there is no cast time, no audio, and no flight path to be seen. Not really a thing you can easily respond to. I vote all PvE is to be based off of PvP mechanics. PvP/PvE balance? Fixt! Kthnx. I think there is a better example of what Gevlon was describing than faction champs. It was designed to simulate pvp. What he is really describing is Moroes, which is still one of the best designed fights in the game. The "how will we compare ourselves against others if we don't have scripted fights" argument is very odd to me. Shooters don't have scripted fights, yet there still ways to compare players: win-loss ratios, accuracy, etc. Single player games don't have scripted fights, yet many have easy ways to compare: high score lists, timed runs. Furthermore I would argue that these are all *more interesting* ways to compare than world first which is as much a function of time available and dedication as it is of raw skill. World first is done in a week and then what is left? Statistics can be accumulated continuously for as long as you would like. How about a PvE season like the Arena seasons? I would rather have a design that encourages me to keep replaying an enjoyable and challenging fight over a design that encourages me to defeat and then trivialize each fight as quickly as possible, while forcing me to keep playing it anyway so that I am ready for the next world first. Well designed? As considered by whom, exactly? Apart from the rose-tinted googles, Moroes is the same as any other unequal council fights. Meaning a number of weaker mooks that have to be CCd/killed before taking on the big boss. Moroes was no different from other such fights, like priestess Delrissa, Fathom Lord Karathress, Hex Lord Malacress, High King Maulgar. Oddly enough, the unequal-council fights seemed to have died with BC, leaving room for the equal-council fights which became a lot more prevalent. Regardless of that, council fights are council fights and the skill set from one is mostly transferable.